For Ellie Willoughby, Boise-based Winco’s vice president of meat operations, putting on a white coat and scabbard with a sharp knife at the University of Idaho’s Meat Science Lab was a return to her beginnings. She began her career as a meat cutter as a 19-year-old pre-veterinary science student looking for a summer job. Her choice turned into the start of a career that has put her in charge of meat departments that employ more than 1,000 in the fast-growing grocery chain’s 105 stores. 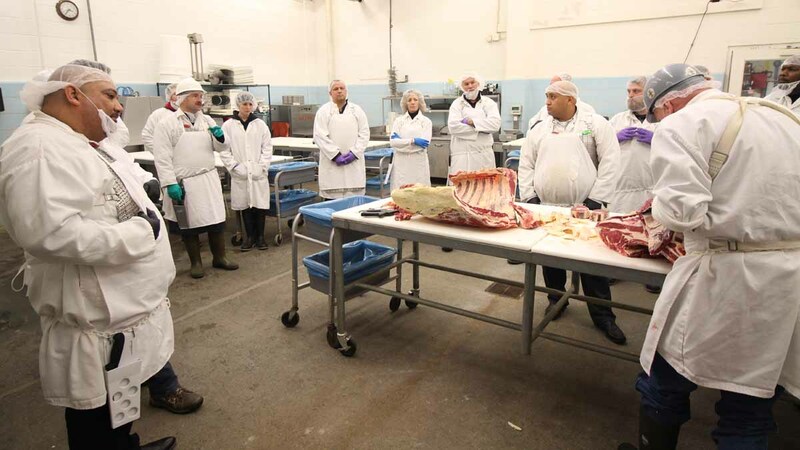 She joined a three-day pilot meat-science workshop offered by the College of Agricultural and Life Sciences in Moscow in early January with 13 other Winco managers and supervisors from across the West. 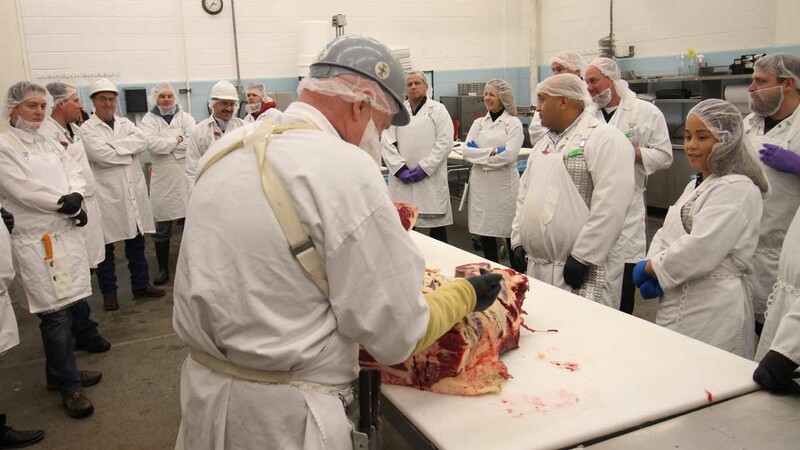 Led by Department of Animal and Veterinary Science meat science faculty members Matt Doumit and Ron Richard, the three-day workshop provided a back-to-basics review. The grocery business has changed through the years, and in particular the meat counter. Greatly diminished are the corner butcher shops or stores where meat cutters handle whole carcasses. Those factors mean fewer meat department workers know as much about different cuts of meat and how to cook them as their predecessors. “I think that over time we have just started to recognize that we have kind of lost some of the art of meat cutting. It’s harder to find people who want to look at it as a career,” Willoughby said. 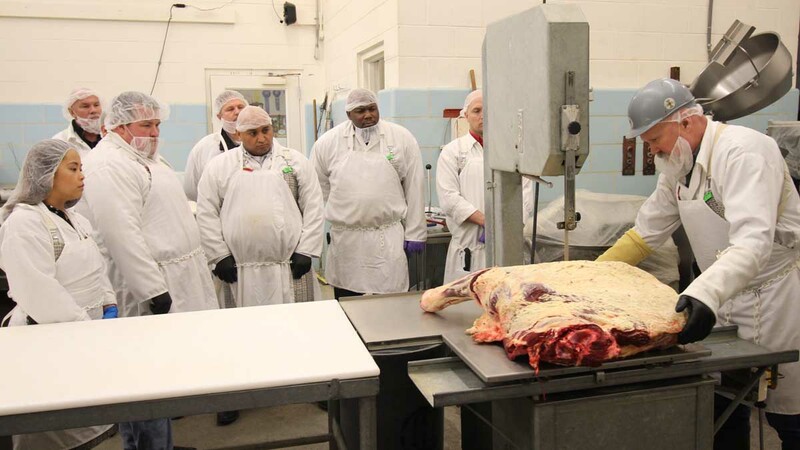 The workshop will help managers and supervisors reconnect with the basics of meat science and pass that information along to their departments and to customers, she said. 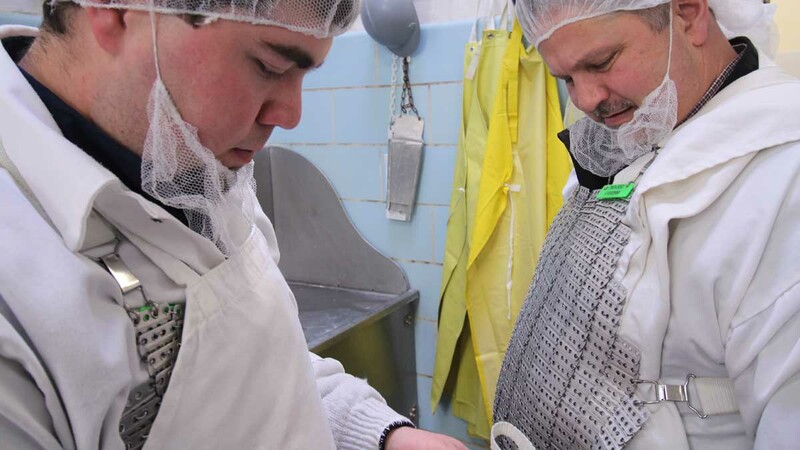 A Monday morning classroom introduction to meat science led by Doumit introduced the research-based side of providing quality products for consumers. That afternoon the participants got a look at the practical side with Richard, the meats lab supervisor, and his Vandal Brand Meats student crew as they demonstrated how to break down a beef carcass into familiar cuts from brisket to steaks. 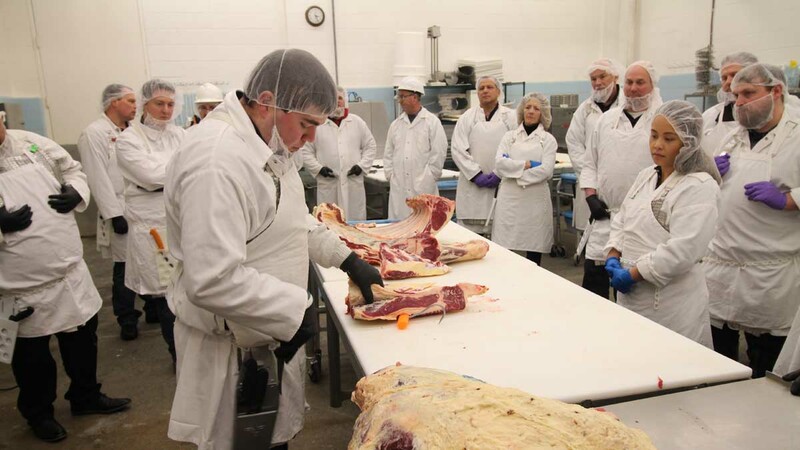 The workshop covered topics ranging from the care and feeding of livestock and the effects on meat quality to breaking down cattle and pig carcasses into familiar products. The idea for the workshop began with a panel discussion during the Idaho Cattle Association’s centennial celebration last year in Boise. CALS efforts to advance its meat science program and modernize its meats lab seemed to mesh well with Winco’s needs, Willoughby said. “Winco is an Idaho company, so having this opportunity to work with an outstanding local university that works directly with the Idaho agriculture industry is even more meaningful,” she added. 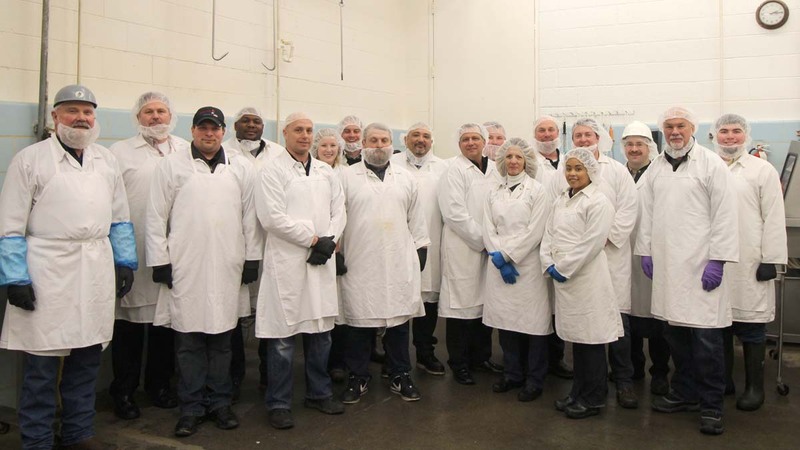 1 of 10: Winco participants and Animal and Veterinary Science faculty and staff in the meats lab. 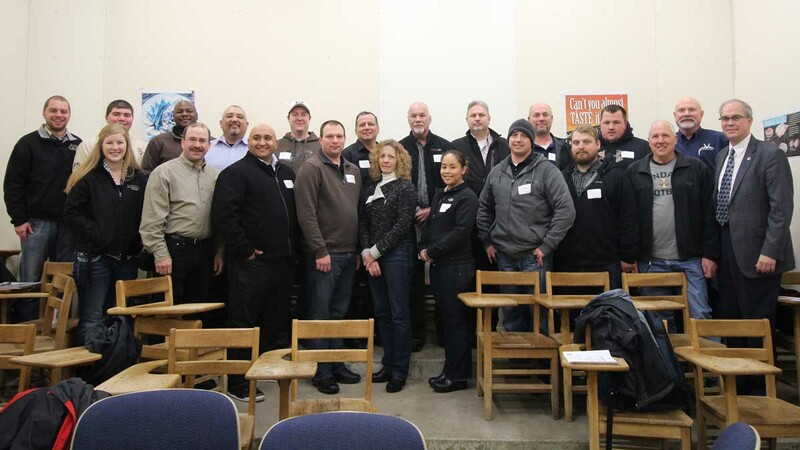 2 of 10: Winco representatives and UI faculty with CALS dean John Foltz. 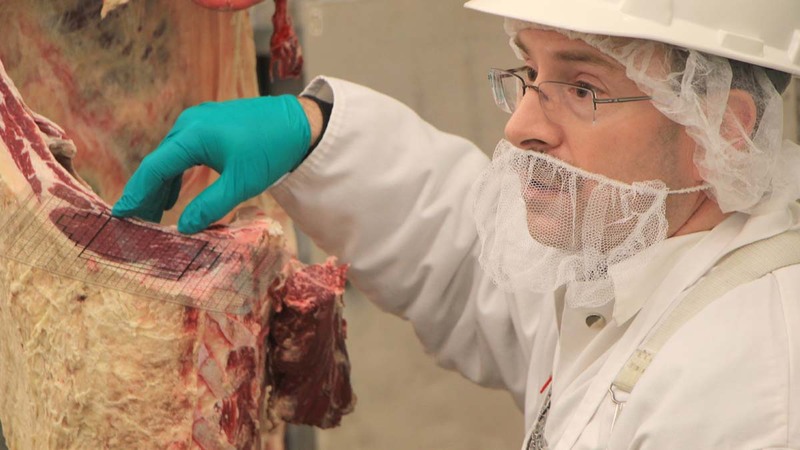 3 of 10: AVS professor Matt Doumit going over carcass quality grading. 4 of 10: Demonstration by Vandal Brand Meats manager, Ron Richard. 5 of 10: Ron Richard demonstrates proper cutting techniques. 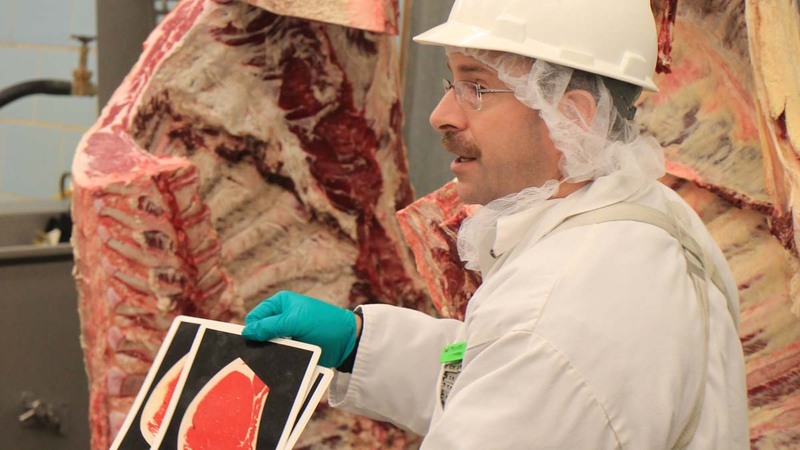 6 of 10: Matt Doumit discussing carcass yield grading, measuring the ribeye area. 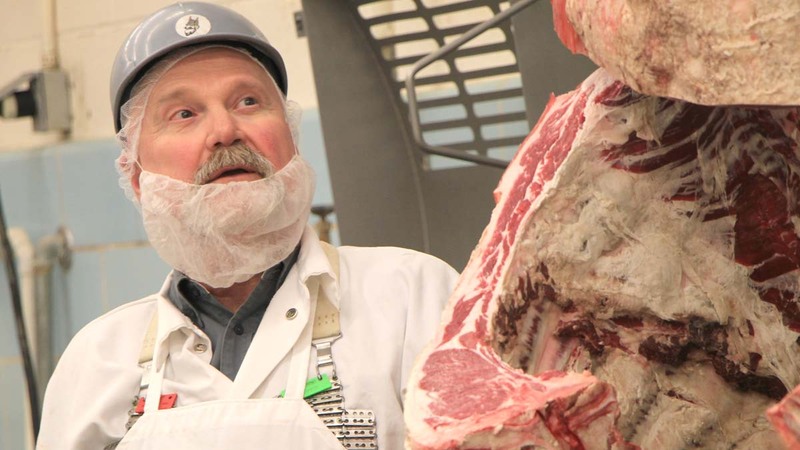 7 of 10: Ron Richard demonstrating where the primal cuts are on a beef carcass. 8 of 10: Suiting up to cut meat. 9 of 10: Breaking down the chuck on the bandsaw. 10 of 10: Meat cutting demonstration by CALS student James Nasados.